Stoner Car Care Racing and Automatic Racing launched the 2019 MICHELIN Pilot Challenge season with a strong showing at Daytona in Friday’s BMW Endurance Challenge. 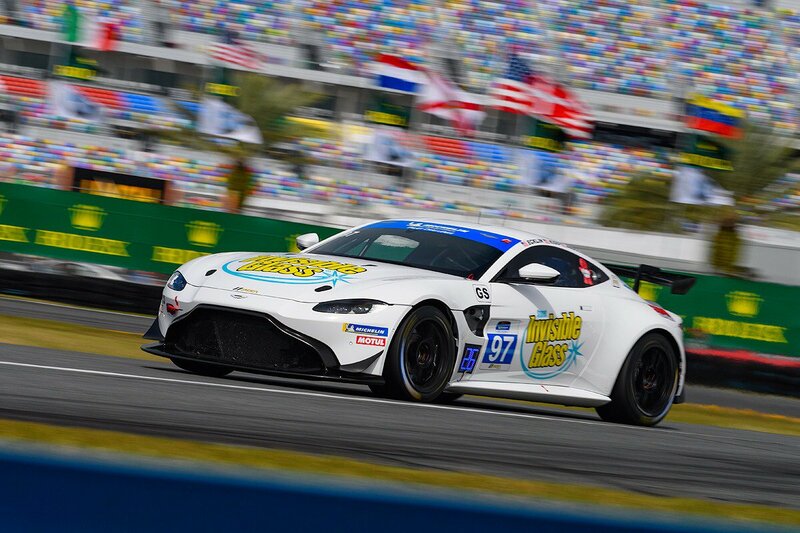 With three Aston Martins being fielded by the team, it was a big effort to be prepared for the four hour enduro to open the 2019 IMSA season. Leading the charge for the Orlando-based squad was the No. 99 Stoner Car Care Aston Martin, driven by rookie Gary Ferrera and veteran Kris Wilson as the team came home with a second place finish after leading nine laps and making a daring last-lap pass to seal second at the finish. 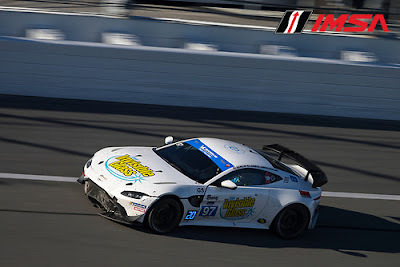 Each of the three Aston Martin Vantage GT4 entries took very different routes to the checkered flag in the four-hour, 101-lap endurance classic, part of the IMSA WeatherTech SportsCar Championship’s Rolex 24 At Daytona. The No. 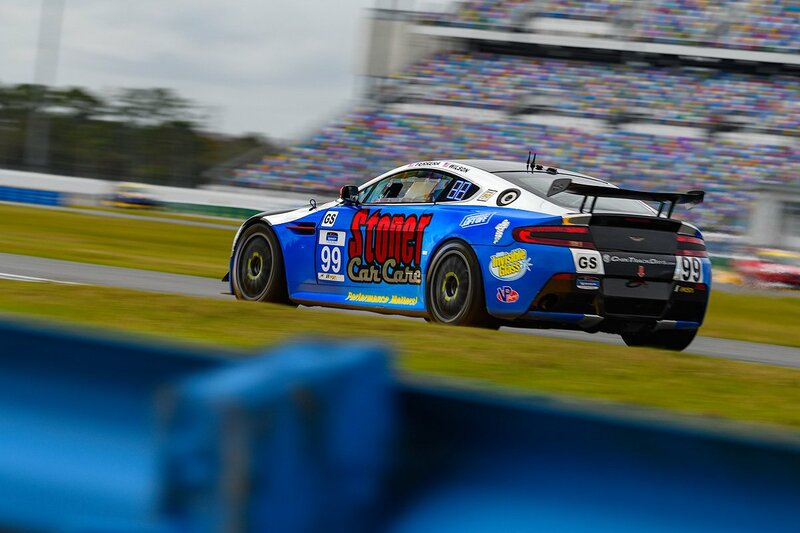 99 Stoner Car Care Aston Martin, driven by rookie Gary Ferrera and veteran Kris Wilson took the green flag in 26th position. Ferrera, in his first race at Daytona, managed traffic in the 35-car field while steadily moving up before handing the car to Wilson in 22nd position. Wilson immediately began carving his way through the field, making calculated passes as he headed toward the front. Taking the lead on lap 81 before heading in for his final pit stop, Wilson came out of the pits in fifth and muscled his way back to the front by lap 85. 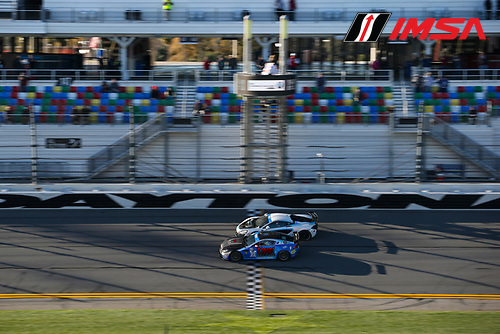 The final 10 laps were a side-by-side, four-way battle that saw Wilson make an outside, nail-biting pass on the high banks of Speedway Turn 2 to take second position – the best finish for Wilson and for the team at Daytona. The No. 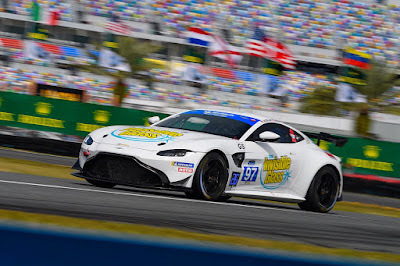 97 Invisible Glass entry, driven by Rob Ecklin, Brandon Kidd and Ramin Abdolvahabi, is the newest iteration of the Aston Martin Vantage GT4. The beautiful machine is the first of its kind to race in North America, and the team had a double effort to prepare for Daytona. The team took delivery of the new car on Sunday and did a phenomenal job to have it prepared from the moment the car was unloaded for the weekend and ready to go for practice and qualifying. 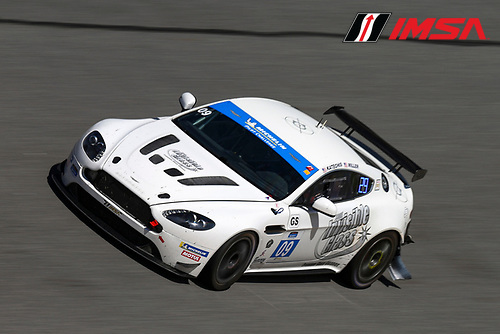 Starting from 31st, the trio of drivers combined to steadily move the car forward, despite track debris that damaged the front splitter. Overcoming the resulting loss of aerodynamics, the team brought the car home in 13th position in its North American debut. The No. 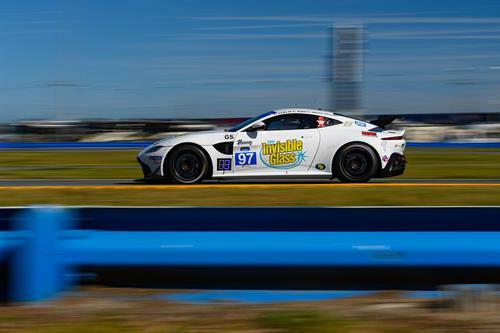 09 Invisible Glass Aston Martin saw the most circuitous route to the finish. Drivers Dale Katechis (in his first Daytona race) and Mikel Miller (in his third) worked what magic they could throughout the race, despite twice having to take to pit lane after suffering from contact early in the race. 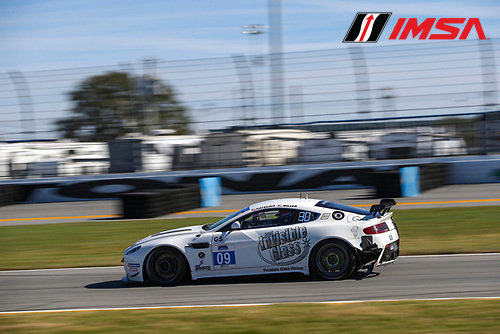 The pair fought their way through the field to bring the car home in 23rd position. Team manager David Russell, spotting for the No. 09, had a birds-eye view of the entire race, and was impressed with the entire effort. 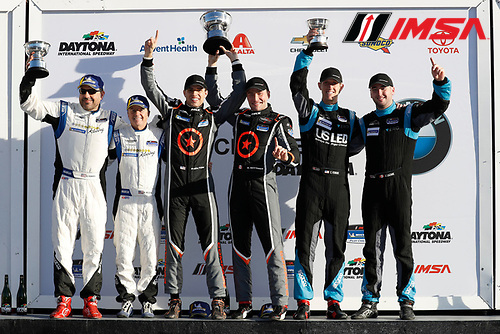 Next up - Sebring early next month.